A Gassville woman already charged with aggravated assault is now accused of attacking a nurse at Baxter Regional Medical Center's Behavior Health Unit. Thirty-seven-year-old Rebecca Wallace entered a not guilty plea to the new charges during an appearance in Baxter County Circuit Court Thursday. Wallace was a patient in the unit in late October when the alleged attack occurred. According to the probable cause affidavit, Wallace went to the restroom accompanied by a nurse. Wallace was reported to have said the sink was not working properly, and as the nurse checked the sink, Wallace is alleged to have torn down the shower curtain and thrown it over the nurse. The two struggled, winding up in the hallway. As the nurse was attempting to get away, Wallace is alleged to have continued to scratch and claw her. Wallace was charged with third-degree battery, a misdemeanor. In the original case set up against her, she was charged in early September with lashing out at an individual after the person found Wallace and a male companion, later identified as Bryan Rocap of Flippin, at a residence where they did not belong. The rather odd incident began when the resident arrived home and found a large quantity of personal items piled on her front porch. 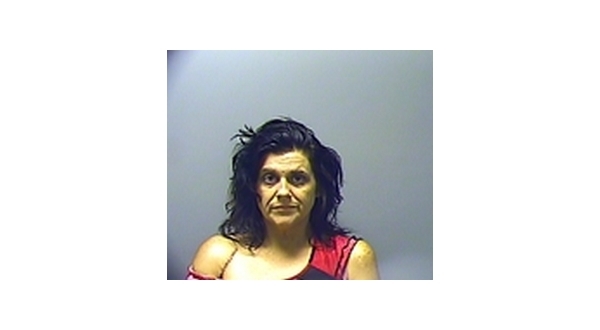 The woman contacted the Baxter County Sheriff's Office asking for help in identifying the owner of the property. The owner was eventually identified as the 38-year-old Rocap. The resident said she was acquainted with Rocap, but had no idea why his property had been left on her front porch. The day after the report was made, the resident called law enforcement again to report a friend of hers had driven by her house and had seen a vehicle with two occupants in the driveway. The friend had prior knowledge of the mysterious property found on the porch and pulled into the driveway behind a green SUV with New Mexico license plates to investigate. At that point, Wallace is alleged to have gotten out of the SUV and approached the friend saying she knew the homeowner who was aware of her presence. As she told the story, she is reported to have become more and more irate. Wallace was not aware the friend was on the phone with the homeowner, who was advising no one should be at her residence. Wallace is alleged to have eventually threatened the friend and hit her van with a baseball bat. Rocap, who was driving the green SUV, backed the vehicle into the friend's van pushing it backward. The victim was able to contact the Sheriff's Office, but Wallace and Rocap fled from the scene before deputies arrived. They were arrested later. The deputies noted blood on the female victim's legs resulting from flying glass inside her vehicle when the bat wielded by Wallace struck the windshield. In addition to a broken windshield, there were dings in the doorpost on the driver's side door and minor damage to the bumper where the SUV pushed the van. The van was a rental belonging to a local car dealership and when the probable cause affidavit was written, an estimate on damage to the vehicle had not been completed, according to the probable cause affidavit. The victim told deputies she had been able to take a short video of the incident using her phone. In early October, Rocap pled guilty to the charges against him stemming from the incident. He was put on supervised probation for four years. Wallace faces more serious charges because she was the one wielding the bat. According to court records, a petition to revoke Rocap's suspended sentence was filed just 14 days after it was handed down. The revocation petition filed alleges Rocap did not show up for his initial intake session and has since avoided contact with probation and parole officers. Rocap is currently listed as an absconder.